The week before her graduation ceremony, Rhiannan McPhee is excited to have already secured a job with a fruit and vegetable company at the Melbourne wholesale fruit and vegetable market at Epping through the GradLink program. She says farming is a bigger industry than she could have imagined before starting her Bachelor of Agriculture at the University of Melbourne. “There’s no one career path; you can change your career a hundred times… from soil science to plants to marketing,” she says. It’s not an unusual situation – a 2016 assessment of graduate outcomes data by Professor Jim Pratley of the Australian Council of Deans of Agriculture show there are around five jobs per graduate, and around 90 per cent of graduates seeking employment are in jobs four months after completing their degrees. 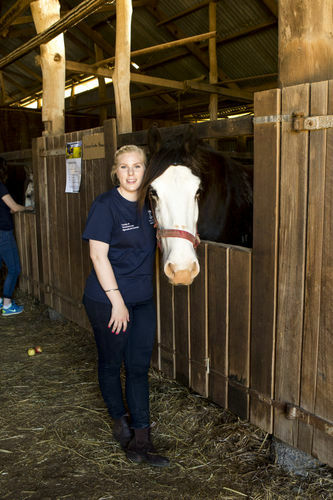 While her family now lives in a semi-regional area near Healesville with four horses, including a rescue thoroughbred, Rhiannan grew up in the suburbs near Lilydale, attending Billanook College. After Year 12, she called the University of Melbourne for advice on what subjects she should choose when she was planning her science degree. She was interested in food production and chemistry, and after suggesting a range of agriculture subjects, the university adviser raised the Bachelor of Agriculture to her. She switched degrees and hasn’t had any regrets. “I wanted to see what would happen on the practical side on a farm and how you would get from paddock to plate,” Rhiannan says. She particularly enjoyed having the opportunity to spend a large part of 2017 at the University of Melbourne’s Dookie campus. “The cohort is very close, with just under 100 of us there,” she says. She was also able to complete a major research project comparing the effects of wheat seeds treated with micronutrients to a liquid foliar spray and a control crop, with various fertiliser rates. “It was really interesting to put all of our research methods, biology and cropping subjects to use and to see a wheat trial from start to finish,” she says. As Year 12 results come in, she says graduating students should not see their score as a defining number. “Yes, it’s important as a first step to get where you want to go, but then you realise when you’re there how many other opportunities you have and how much your mind will change,” Rhiannan says. Written by Stuart Winthrope. Banner image: Canola at the University of Melbourne's Dookie campus.